Michigan State University President, Lou Anna Simon resigned late Wednesday over criticism of the university’s handling of sexual abuse claims against former sports doctor Larry Nassar. Simon resigned hours after Nassar was sentenced to between 40 and 175 years in prison for molesting women and girls while supposedly treating them for sports injuries. In her resignation letter, Simon addressed the survivors of Nassar’s abuse, saying she was “so sorry that a trusted, renowned physician was really such an evil, evil person who inflicted such harm under the guise of medical treatment”. Nassar pleaded guilty to assaulting seven people in the Lansing area, including in his home basement and at his campus office. However, more than 150 women and girls confronted Nassar about his abuse at an extraordinary seven-day sentencing hearing. Many of the victims accused the university of mishandling complaints about Nassar, some of which go back more than two decades. Campus police got its first report regarding Nassar in 2014, but the Ingham County prosecutor declined to file charges. The school continued to employ him after he was the subject of a sexual assault investigation in 2014. Former Michigan State gymnastics coach Kathie Klages resigned last year after she was suspended for defending Nassar over the years. 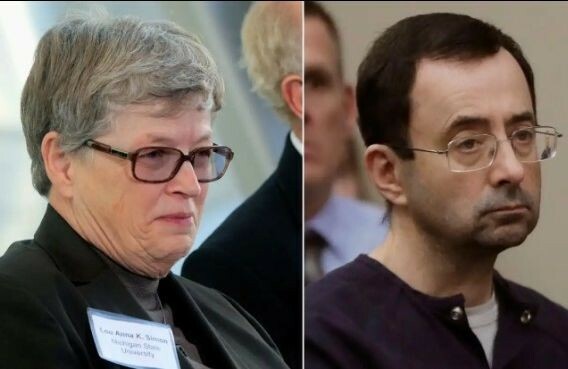 Simon wrote that she had planned to retire in December 2016, but “my transition was postponed” in the wake of the initial allegations against Nassar, which surfaced after an Indianapolis Star report on how USA Gymnastics handled sexual abuse allegations against coaches. That report prompted a former gymnast to alert the newspaper to Nassar’s abuse. Michigan State’s Board of Trustees initially voiced their support of Simon last week only to have one of them, Mitch Lyons, issue a statement the next day saying she should resign. On Wednesday, a second trustee, Dianne Byrum, and U.S. Sens. Debbie Stabenow and Gary Peters joined the chorus calling for Simon to step down. Hours after Nassar’s sentencing, Michigan lawmakers voted overwhelmingly for a nonbinding House resolution that sought Simon’s removal over the allegations. “As tragedies are politicized, blame is inevitable,” Simon wrote. “As president, it is only natural that I am the focus of this anger. I understand, and that is why I have limited my personal statements”. Michigan State faces further scrutiny in the Nassar case. The state’s attorney general plans to investigate how the university handled the allegations. In addition, the NCAA sent a letter to Michigan State earlier this week asking for any potential rules violations related to Nassar, the first indication an investigation by the college sports governing body might be next. Simon earned her doctorate at Michigan State in 1974 and was promoted to school president in 2005. “Throughout my career, I have worked very hard to put Team MSU first. Throughout my career, I have consistently and persistently spoken and worked on behalf of Team MSU. I have tried to make it not about me. I urge those who have supported my work to understand that I cannot make it about me now”. Fox News and The Associated Press contributed to this report.